1,784 SQ FT IN GILBERT WITH HEATED POOL! Perfect Gilbert location at Val Vista & Baseline and there’s no HOA! Renovated 4 bedroom, 2 bathroom, bright open single floor plan. 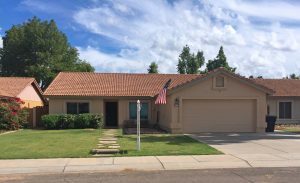 Spacious living and family rooms, extensive tile flooring, vaulted ceilings, designer paint throughout, wrap around granite counters, stainless steel appliances, pantry, breakfast bar, bayed dining area. Large master bedroom with walk-in closet, extended dual sink counter with vanity, tiled shower surround. Relaxing backyard haven with efficiently heated pool with water feature, spacious covered patio, and mature landscaping. All just minutes to the freeway, downtown Gilbert, Freestone Park, Dana Park, an incredible assortment of dining, shopping and entertainment.